eHow and Mahalo: How Many Keyword Variations is Too Many? eHow and Demand Media’s reputation for creating large volumes of low quality content are well known so no need to go into that here. But a more practical topic for content publishers is when it comes to keyword targeting, how many variations is too many? As I covered in my post on editorial SEO tactics mapping out the keyword universe around a particular topic and making sure that all aspects of it are being effectively covered is a worthwhile effort. It is particularly helpful for sites with a lot of evergreen content. But that is very different from recycling what is essentially the same information on multiple pages in an effort to target several keyword variations. So what’s the right approach? Put yourself in your reader’s shoes. If there is not enough unique content to warrant a separate article, don’t make one. In such cases a single high-quality page is better for users and ultimately better for SEO. It avoids keyword cannibalization and allows internal and inbound links to be focused on a single URL. In cases where there is enough unique content to warrant multiple articles, then smart keyword targeting combined with an effective internal linking strategy offers good opportunities to increase the search engine visibility of all of the pages. For help with targeting multiple keywords on one page vs. several pages see When Keyword Targeting Gets Tough and Keyword Targeting: How to Employ Multiple Keywords for SEO & Conversions from SEOmoz. Let’s go back to the “how to cook a turkey” example. There is little benefit to recycling the same basic instructions on multiple pages with slightly different keyword targets. However, there are in fact a lot of different ways to cook a turkey and many different turkey recipes out there. 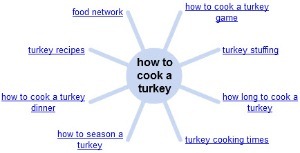 So having a reasonable number of unique pages focused on different ways to cook turkey is ultimately helpful to users and allows a site to go after a variety of different keyword targets. It’s just a matter of striking a proper balance. Be sure to check out the comments; there’s a good discussion going between Jason and several others on the quality of eHow vs. Mahalo and Mahalo’s plans for improvement. It would indeed seem that those in glass houses should not throw stones. ~100 sounds like the right number of cooking turkey videos. Do you think you might want to compare this search to ehow? Also, many of those are questions and answer pages…. Yahoo Answers and Answers.com have 30k pages to our 100.
and Mahalo is at fault for having 100? I don’t know why jason tries to defend his pos site. Why not add other articles such as how to cook a 1lb turkey.. 2lb turkey etc. Can’t wait for the day mahalo and ehow disappear. Hey Jason, you might want to check your own site before you start throwing your rocks. You’re not fooling anyone, all your site is is one huge spam emporium with a fresh coat of paint. I work as a developer at Mahalo and definitely understand your arguments for quality in this post. I wanted to clarify an few issue with the site search argument. A large number of the results are for http://www.mahalo.com/url-slug/discuss <– discuss pages have been removed as of the relaunch of the site so they should be 301 redirecting to just the page. Google's index just hasn't caught up with that yet. Also, anything with /answers/ in the url is a question posed by a user. So we're really not in control of that, although we are working to remove redundancy in our answers product by improving our internal search to get users what they're looking for. Removing those, we're left with 8 results. That may include some redundancy and that's something we're definitely trying to improve. Try this search: site:mahalo.com intitle:cook intitle:turkey -inurl:"answers" -inurl:"discuss"
Jason – I agree; there’s no doubt eHow is the greater offender. My main aim for this post was to highlight the fact that there are situations in which targeting multiple variations on different pages is a good approach. It just has to make sense for users and be done within reason, and I think turkey cooking methods and turkey recipes fits that criteria. 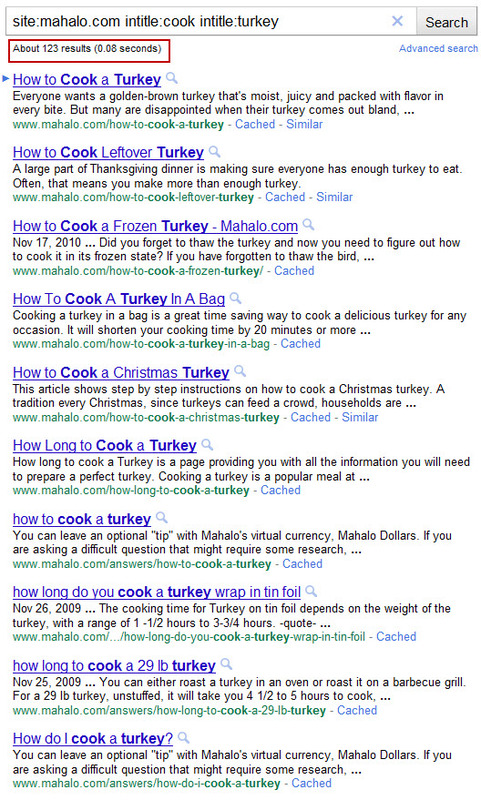 But since you were quoted as saying eHow has 17 different articles around “how to cook a turkey” I just wanted to point out that Mahalo has quite a few too. Jeff – thanks for the information on the discuss and answers pages, that makes sense. User generated content can certainly increase volume considerably and often leads to duplication and overlap. Jason; you aren’t comparing apples to apples, Adam’s search query used intitle:coo intitle:turkey for which eHow only has 322 results (not 16k). Same query for allrecipes.com results in 18 pages. Plus they outrank both bottom feeder sites (eHow & Mahalo). We did a series of like 20+ videos around thanksgiving. At least. We’ll probably do another 30-50 for next year. I suggest looking at those videos, their production quality and asking what value you think they have. Also, we can’t control how many questions folks ask about cooking turkey! Because we are ranking well for turkey, and because our Q&A service works so well, we are going to host a lot of turkey Q&A. Google does know the difference between Q&A and How to pages (obviously), and I think you’ll see Q&A threads regulated to the “discussions” tab in Google searches in the future. Let’s stop talking about the raw numbers in search–although that is important–and focus on the real issue: the quality of the page. Rate any of those pages on a scale of 1 to 10 and tell me what you honestly thing about them. Our quality folks will read that, take it to heart and improve them. Quality is our focus as you can see by the massive investment of tens of millions of dollars, that we are putting into video. Thanks for the feedback everyone…. but now I need to get back to work making killer videos! you can watch the videos as they are published at http://www.youtube.com/mahalodotcom (in large part, we have 50 other YT channels as well on niches, like MahaloMath and Mahalocooking). b) what % of pages the site is indexing are high, medium, low or ultra-low in value. You will find that ehow has a ton of ultra-low to no-value pages that are simply there to flood the index. Mahalo is the opposite. You will see a bunch of ultra-high quality (thousands of dollars invested in a SINGLE page! ), and some medium quality and very, very few low quality. The low quality ones are being redirected to the high-quality ones or built out. Over the next year you will have a VERY hard time finding anything below medium…. I know because that is what I do all day long as CEO. I focus on finding lower or medium quality pages and telling the team how to improve them, or where to delete/redirect them to quality pages. Additionally, we’re thinking of a public scoring option. If the public votes a page low quality we might actually flag it and turn it off. This would certainly be a novel approach. Dustin – thanks for making the point on the “site:” and “intitle:” searches. With just “cook turkey site:X.com” as you go deeper in the results you end up with a lot of pages that just happen to have “cook” and/or “turkey” on the page somewhere; sometimes just in links to other articles. So I used “intitle:” for a specific look at pages that are specifically targeting those terms. Jason – it’s a good point in terms of looking at the ratio of high/medium/low/ultra-low content. Really sites should only produce high quality content in the first place. But all content sites (even major publishers) have some percentage of low quality content that is ultimately a negative for the domain over time. So doing a quality audit then improving, weeding out or consolidating lower quality content is a good approach. Back to your main “how to cook a turkey” page (http://www.mahalo.com/how-to-cook-a-turkey), I agree that the page has legitimate, useful content and the professional videos are a strong plus. You could almost say there’s too much content on the page; it’s a little overwhelming and some of those subtopic videos warrant their own page (maybe you do that too). The block of AdSense ads right at the top of the page doesn’t make a great first impression; that might lead some users to think it’s a low-value aggregation page. But everybody’s got to make a living, so if that’s monetizing well and engagement on the page is strong than so be it. “Put yourself in your reader’s shoes. If there is not enough unique content to warrant a separate article, don’t make one.” This is a great point, when in doubt put the user first. That’s what Google wants you to do. I’m looking forward to how the new crowd sourcing of web spam by Google will affect sites like ehow. I will be glad to see “content farms” disappearing. Do you think new SE algorithms will use more and more social ratings? I think best practice is changing along with Google’s algorhythm. It might have been best to target for one long-tail keyword phrase per article before, but Google is getting smarter than that. An article using 3-4 phrases can rank well for all of those phrases.